In a world where everything from floor wax to handheld computers are described as being magical, what does being a magician really mean? Gordon Meyer, a long-time magician and trained sociologist, answers that question by turning to the worldwide id known as Twitter. This collection of one hundred carefully curated quips about conjuring is funny, surprising, insightful, and sometimes just plain odd. 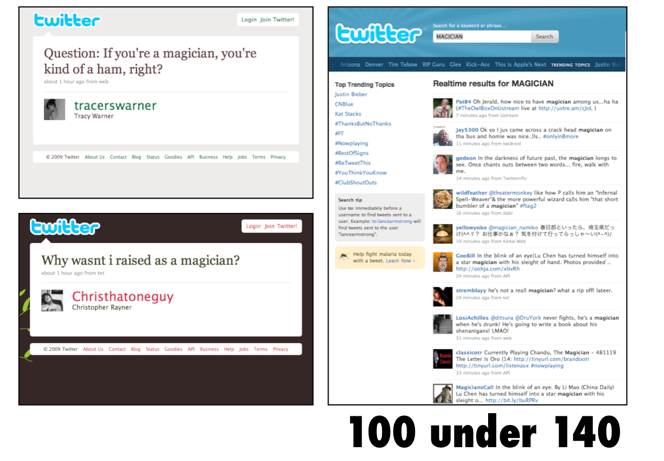 100 under 140 is a trademark of Gordon Meyer. All Rights Reserved. Contact.